More than twenty New York Times bestselling authors team up to create a first-rate serial novel — a collaboration that combines the skills of America’s greatest storytellers to produce a gripping, spellbinding mystery. When Christopher Thomas, a ruthless curator at San Francisco’s McFall Art Museum, is murdered and his decaying body is found in an iron maiden in a Berlin museum, his wife, Rosemary, is the primary suspect, and she is tried, convicted and executed. Ten years later, Jon Nunn, the detective who cracked the case, is convinced that the wrong person was put to death. In the years since the case was closed, he’s discovered a web of deceit and betrayal surrounding the Thomases that could implicate any number of people in the crime. With the help of the dead woman’s friend, he plans to gather everyone who was there the night Christopher died and finally uncover the truth, suspect by suspect. Solving this case may be Nunn’s last chance for redemption … but the shadowy forces behind Christopher’s death will stop at nothing to silence the past forever. In this innovative storytelling approach, each of these twenty-five bestselling writers brings their distinctive voice to a chapter of the narrative, building the tension to a shocking, explosive finale. 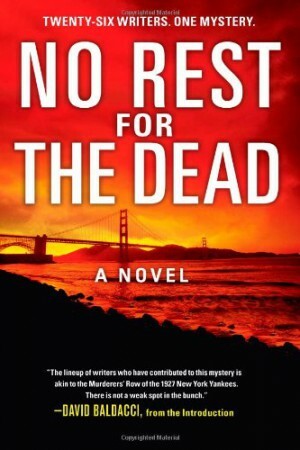 No Rest for the Dead is a thrilling, page-turning accomplishment that only America’s very best authors could achieve. ""'No Rest for the Dead’ is more than just a stunt. Anyone who loves a good mystery will love this book and to top it off proceeds go to a good cause.”"
"“The plot was gritty, suspenseful, and compelling. It was definitely everything I would expect from authors I've come to love, and authors I'm hoping to get to know better.”"
""A fast-paced mystery that will have the reader guessing until the final chapter."" ""The end result is an interesting mystery that deftly weaves the contributions of these great authors into a surprisingly cogent and surprising mystery.""